Xiaolóngbāo, also known as soup dumpling, is a type of baozi from eastern China, including Shanghai and Wuxi. It is traditionally steamed in small bamboo baskets, hence the name (xiaolong is literally "small steaming basket"). Left: Steamed Xiaolongbao served on a bed of napa cabbage. Xiaolongbao are more often known in Shanghai and its surrounding areas as xiaolong mantou. Mantou describes both filled and unfilled buns in southern China, but only describes unfilled buns in northern China. 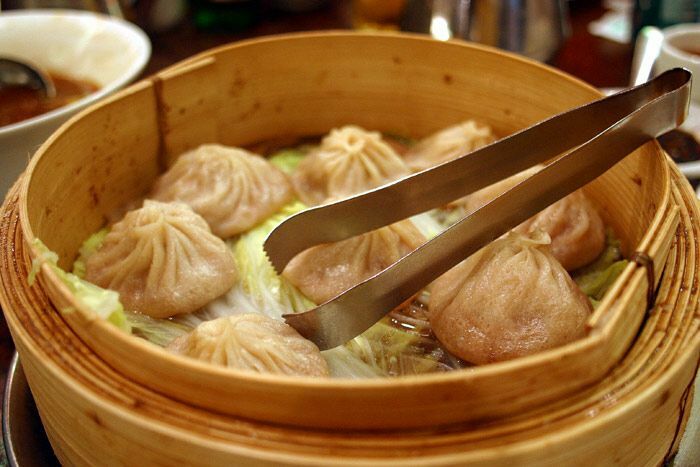 To avoid confusion, the name xiaolongbao is usually used in other areas. Xiaolongbao in Wuxi tend to be sweeter and have a thinner dough skin, and are juicier than the Shanghai variety. Chinese buns in general may be divided into two types, depending on the degree of leavening of the flour skin. Steamed buns made with raised flour are seen throughout China, and are what is usually referred to as baozi. Steamed buns made with unraised flour are more commonly seen in the south. The Xiaolongbao belongs to the latter category. This means that its skin is smooth and somewhat translucent, rather than being white and fluffy. The similarity of this appearance to that of jiaozi ("dumpling") has meant that the Xiaolongbao is sometimes classified as a dumpling outside of China. It is, however, distinct from both steamed and boiled jiaozi in texture and method of production. Xiaolongbao are traditionally filled with pork, but variations include other meats, seafood and vegetarian fillings, as well as other possibilities. The characteristic soup inside is created by wrapping solid meat gelatin inside the skin alongside the meat filling. Heat from steaming then melts the gelatin into soup. In modern times, refrigeration has made the process of making Xiaolongbao during hot weather easier, as one can use chilled gelatin which might otherwise be liquid at room temperature. As is traditional for buns of various sizes in the Jiangnan region, these steamed buns feature a skin that is gathered up into fine folds at the top prior to steaming. The buns are served hot as a snack in the bamboo baskets in which they were steamed, often on a bed of napa cabbage, and may be dipped in Chinkiang vinegar with ginger slivers. Xiaolongbao have also become popular as a main dish. Frozen Xiaolongbao are now mass produced and a popular frozen food sold worldwide.